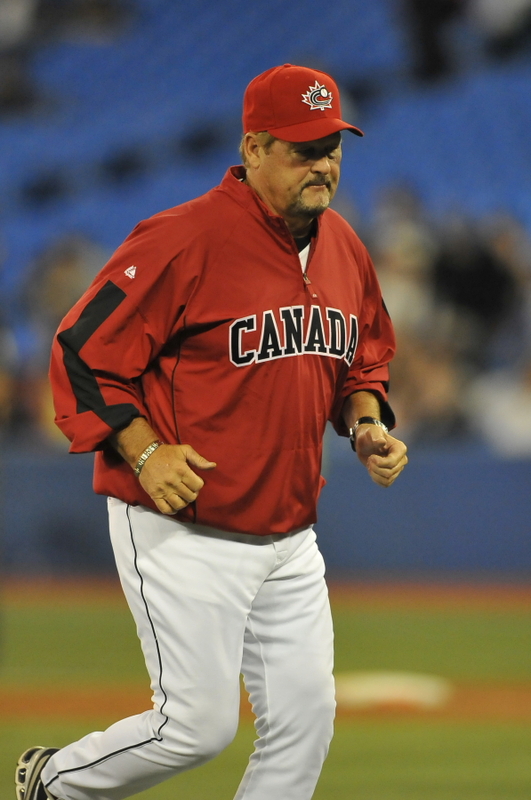 Ernie Whitt will once again be the manager of the Canadian team at the World Baseball Classic. (Photo courtesy of Canadian Baseball Hall of Fame).  Guelph, Ont., native Scott Diamond has jumped out to a commanding lead in the online voting for the Canadian Baseball Hall of Fame’s Tip O’Neill Award. The Minnesota Twins lefty, who won 12 games and posted a 3.54 ERA this season, leads Canadian women’s national team MVP Stephanie Savoie by 187 votes. Cincinnati Reds first baseman Joey Votto (Etobicoke, Ont.) and free agent hurler Ryan Dempster (Gibsons, B.C.) are third and fourth in the voting respectively. The online voting is just one component that the Hall will use to determine the winner of the award that’s presented annually to the top Canadian player. If you haven’t already done so, you can still vote for the award at www.baseballhalloffame.ca until midnight ET on November 30.  Ernie Whitt wasn’t named to the Toronto Blue Jays’ coaching staff earlier this week, but Baseball Canada announced on Wednesday that he’ll once again manage the Canadian squad at the World Baseball Classic. Joining Whitt on the coaching staff for the March 2013 tournament are Larry Walker (first base/hitting coach), Tim Leiper (third base coach), Denis Boucher (pitching coach), Paul Quantrill (bullpen/pitching coach), Stubby Clapp (coach) and Greg Hamilton (coach and director of national teams).  Speaking of the Blue Jays’ new coaching staff, John Gibbons had tabbed former Orioles and Red Sox coach DeMarlo Hale to be his bench coach in 2013. Hale will replace Don Wakamatsu, while former Jay Pete Walker will supplant Bruce Walton as the club’s pitching coach. Ex-Jay Chad Mottola takes over as the batting coach, pushing Dwayne Murphy to first base/outfield coach duties, while former Montreal Expo Luis Rivera will be the third base coach.  An interesting note on Mottola, he suited up for three Canadian teams during his 16-year professional playing career: the Toronto Blue Jays (2000, 2006), the Marlins’ Triple-A affiliate Calgary Cannons (2001) and the Orioles’ Triple-A Ottawa Lynx squad in 2004.  Condolences to the family of former Montreal Royals and Vancouver Mounties outfielder Chuck Diering who died after a fall at his home on November 23. Born in St. Louis in 1923, Diering was signed by his hometown Cardinals in 1941 and toiled with the club from 1947 to 1951 before being dealt to the New York Giants and finishing his big league career with the Baltimore Orioles. He enjoyed stints with the Triple-A Montreal Royals and Vancouver Mounties in 1956 and 1957.  Jon Heyman of CBS Sports is reporting that the Pittsburgh Pirates appear to be the frontrunners for Canadian catcher Russell Martin. According to Heyman, the Pirates could be offering a three-year deal in the $25-million range. The Yankees, Mariners and Rangers are also reportedly interested in the Montreal native. As a fan of Ernie Whitt, it is equally great to see my neighbour from down the street Paul Quantrill working with Canada’s best baseball players. Everyone knows about the contributions Ernie has made for this country’s elite stars. I was lucky enough to see how Paul works with children here in Northumberland County and in the town of Port Hope where he and his family reside. It will be no surprise to me if Canada should finish among the top teams in the World Baseball Classic. Thanks for comment, Joe. Great to hear that Quantrill makes such a positive contribution to his community. What a great coaching staff for the WBC. How let’s hope the teams let the players play in the tournament. Russell Martin as SS would be interesting. Great hands, but not sure about his range. If I was Russell, I would go back to NYY. The most historic franchise in baseball history and with a chance to win every year! Thanks for the comment, Scott. Yes, it will be interesting to see Martin at shortstop. But if it gets Kottaras’s bat in the lineup, it might be worth rolling the dice on. I have to go with Diamond winning this year. he definitely deserves it. Thanks for the comment, Devon. Diamond definitely had a breakout year. I’d be happy with Votto, Diamond or Dempster winning it.